This project has literally been more than a year in the making. But when I finished part 1 15 months ago I really thought I was done. Turns out that I wasn’t. I decided sometime in March that I needed to add a few more things to it. And it took me three more months to get around to finishing it. 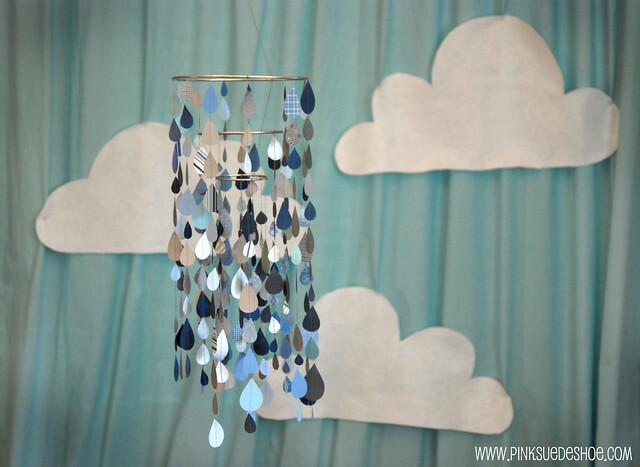 This my friends is a raindrop chandelier, or a paper rainstorm or something. I got the idea to make this from a pile of leftover scraps from an art journal page I made last spring. You can see the awesome pile of leftover raindrops up in the corner, right? I guess I kind of went overboard on cutting them out. Anyway, they sat in a pile for a long time until I got the idea to sew them together and tie them onto a ring. And it hung up above my desk like that for a year. And then a few months ago I got the idea to add a larger ring of rain and a smaller one and turn it into a much beefier, rainier chandelier. I used some chrome spraypaint one one side of my papers to add a little shimmer, and to cover up whatever was on the backside. Some of my paper scraps were double sided, and if the flip side didn’t fit into my color scheme I sprayed them chrome. After I sprayed all my paper I started cutting out raindrops. I think I spent one evening watching a movie and cut out about 300, maybe 400 raindrops ranging in size from .5 inches tall to about 1.5 inches. It didn’t take as long as you might think. I was surprised at how quickly my little pile of raindrops became a large pile of raindrops. But I love the end result. 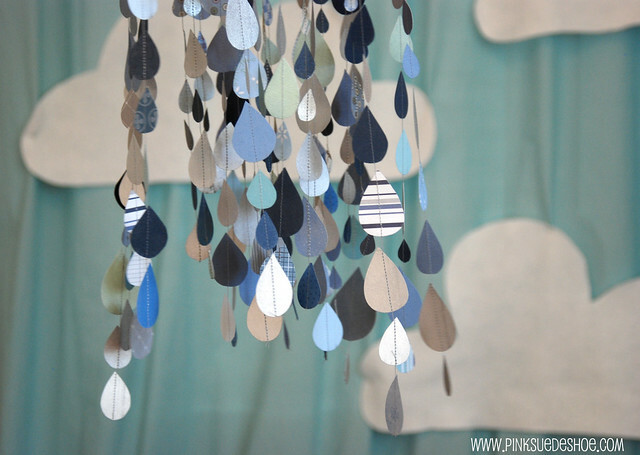 And I love that I still had clouds pinned to my fake dining room curtain from a baby shower a few weeks ago. (This is the same thrifted sheet turned curtain backdrop I used for Creamie’s birthday party.) 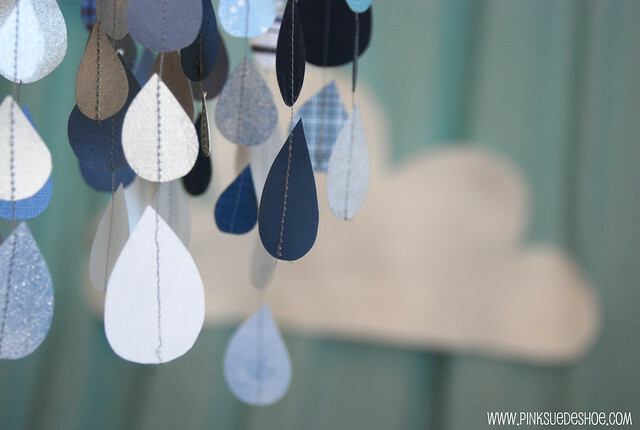 The clouds were the perfect backdrop for my little paper rainstorm. Here in Utah we had a ridiculously rainy spring. And while most people think that rainy days (or snowy days for that matter) are “bad” weather, I think they are absolutely beautiful. And those are the kinds of days that I want to stay inside and bake bread and make something. I love those “bad” weather days! This little rainstorm is currently hanging up in the corner above my desk. And everytime a little bit of breeze comes through, or the heater turns on and moves the air around a bit, or I open the door it starts to spin and twirl and shimmer. It is absolutely beautiful. Much prettier than I ever could have imagined. Besides, now I can tell people that I have a dancing rainstorm over my desk. And how awesome is that? Not bad from a reject pile of blue paper scraps, and a little spray paint. Not bad at all. So pretty! I am so jealous of your ability to make rooms beautiful. I have no creativity in decorating. At all. Sad. Want to go on a vacation and come decorate my house? P.S. 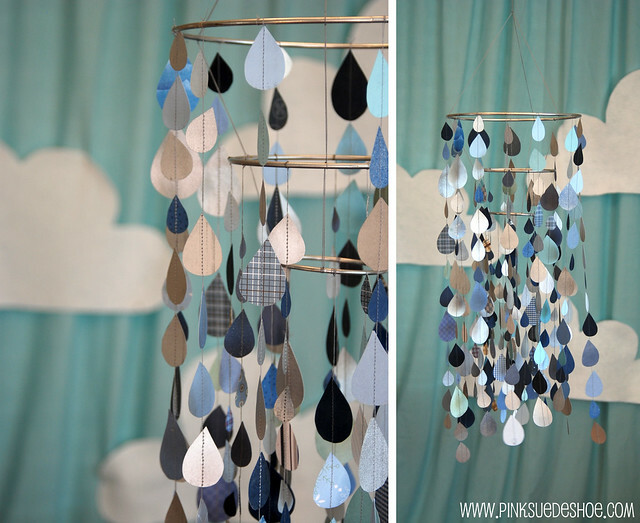 I made these really cute mobiles for my SIL’s when all four of us were pregnant at the same time. I figured I’d make one for me, too–not so, after I figured out just how hard it was to get the dang ring thing to balance on the threads. SO incredibly frustrating. I can only imagine what it was like with 3. Seriously, I’m amazed. And it’s beautiful. I am in love. Even though I don’t love snow nearly as much as you, I LOVE the rain more than anything. this is so beautiful and encompasses the feel that rain gives. stunning. you are stunning. Okay, the chandelier is adorable, but the room!! Is there a workspace tour somewhere that I should know about?? Another fabulous creation . . . I just love reading about your crafting adventures . . .
What a beautiful project! Love it — thanks for sharing. And I especially love the color on the walls … can you … will you share what it is? Breathtaking! What a fabulous idea; I am very impressed (and a little jealous). Just beautiful. it turned out gorgeous! congrats! nothing better than finishing a project! very cute and clever! 🙂 I like the sparkles to. 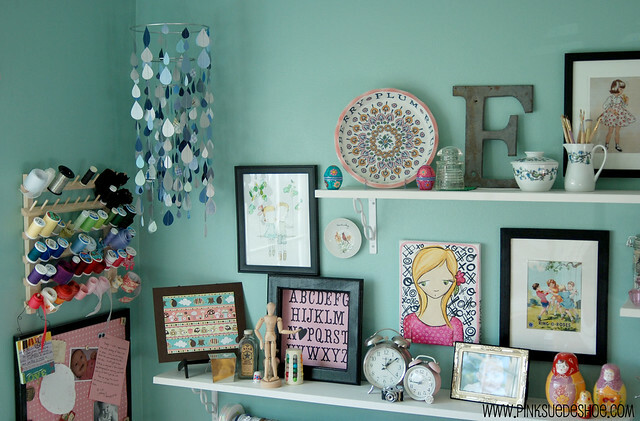 I LOVE LOVE LOVE your work space, its amazingly fab and looks lovely and I want it soooooo much! Wow!! Thats some dilligence you have there! But it looks great though! 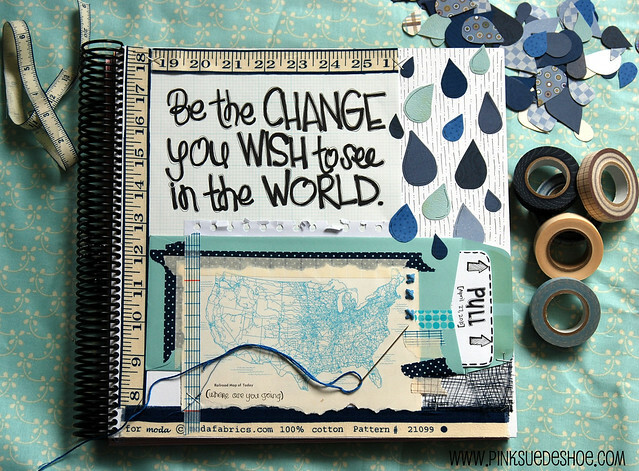 I REALLY like your art journal page..is where a place you have where we can sneak a peak of more pages? Well Thank you! All my art journal pages I’ve shared online are in my flickr set here http://www.flickr.com/photos/pinksuedeshoe/sets/72157624522507957/. Absolutely love this! What a great idea! I absolutely love this. And I feel the need to try my own hand at this. Thank you for inspiring me!